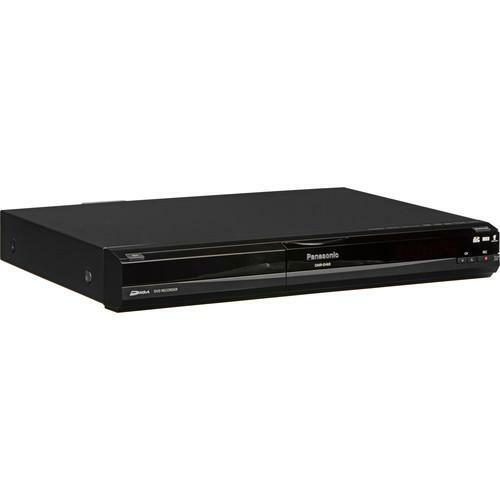 We recommend checking out our discussion threads on the Panasonic DMR-EH69GA-K Multi-Zone 320GB HDD/DVD DMR EH69GA-K, which address similar problems with connecting and setting up DVD Players Panasonic. The user manual for the Panasonic DMR-EH69GA-K Multi-Zone 320GB HDD/DVD DMR EH69GA-K provides necessary instructions for the proper use of the product TVs & Entertainment - Blu-ray & DVD Players - DVD Players. For media mavens who want to play, record, and archive their music, photos, and videos across a variety of storage formats, the Panasonic DMR-EH69GA-K Multi-Zone 320GB HDD/DVD Recorder offers a dizzying array of choices that will satisfy the most demanding requirements. We've imported this European version specifically so you can enjoy more options than you'll usually find on North American models. If you own a Panasonic dvd players and have a user manual in electronic form, you can upload it to this website using the link on the right side of the screen. Note: Packaging may state that this unit is 220 V AC only. The product has been modified to also run on 110 V AC. Warranty Note: This unit may require a multi-system TV or system converter to view PAL DVDs in the US. This item is imported and it is not supported by a MFR warranty. To support this product B&H Photo provides a 90-day warranty. Box Dimensions (LxWxH) 20.5 x 17.5 x 6.5"
The user manual for the Panasonic DMR-EH69GA-K Multi-Zone 320GB HDD/DVD DMR EH69GA-K can be downloaded in .pdf format if it did not come with your new dvd players, although the seller is required to supply one. It is also quite common that customers throw out the user manual with the box, or put the CD away somewhere and then can’t find it. That’s why we and other Panasonic users keep a unique electronic library for Panasonic dvd playerss, where you can use our link to download the user manual for the Panasonic DMR-EH69GA-K Multi-Zone 320GB HDD/DVD DMR EH69GA-K. The user manual lists all of the functions of the Panasonic DMR-EH69GA-K Multi-Zone 320GB HDD/DVD DMR EH69GA-K, all the basic and advanced features and tells you how to use the dvd players. The manual also provides troubleshooting for common problems. Even greater detail is provided by the service manual, which is not typically shipped with the product, but which can often be downloaded from Panasonic service. If you want to help expand our database, you can upload a link to this website to download a user manual or service manual, ideally in .pdf format. These pages are created by you – users of the Panasonic DMR-EH69GA-K Multi-Zone 320GB HDD/DVD DMR EH69GA-K. User manuals are also available on the Panasonic website under TVs & Entertainment - Blu-ray & DVD Players - DVD Players.